Everybody I talk to has this wonderful disease of the thumb that has really flared up lately and they love to brag about it. Hahaha...I'm jealous brother, that's one disease I am dying to get..soooon!! It's a side effect of MSOCD. I did a quick search for bleeding thumbs, and ran across an interesting website. This is not an endorsement for the product. But, it does apply to having sore thumbs. Mr. Cox, it is not kind to speak of such things when we cannot participate in said activity. It borders on cruel and unusual punishment. I don't have a lot of vacation left and you are making it difficult for me to keep a job!!!! Keep crank'in 'cause I know you will and I'm sure you are having a blast. I need to get me some of that. I hope it is this weekend. "COME ON DOWN" I think I have heard that somewhere. The fishing and catching is great. I'm about ready to head south, in-order to wear some more of the sore thumb syndrome. It was really nice running in to some of the names I've seen on this forum. 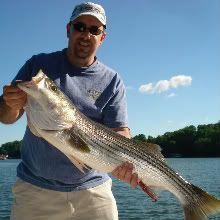 Now the problem is...south or go to Raystown Lake in Pa.
Ranger , it would be a no brainer for me. I live in pa. and i would pick east tn. lake fishin anytime over Raystown. I gotta take a few days off or I'll need a skin graft. I got thumb, hand, and forearm disease. My right hand (aka the dehooker) is all tore up! My right hand (aka the dehooker) is all tore up! Just jealous of you guys - I spent Sat AM unhooking lots of 6-8" black sea bass - not much to work your thumb there.... fat fingers too big to even lip those little ones.